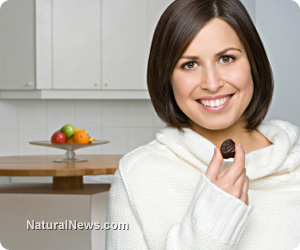 (NaturalNews) Imagine using chocolate to remineralize tooth enamel while discouraging cavities. Sound too good to be true? A researcher at Tulane University has come close with a non-toxic chocolate extract that outperforms fluoride. Taking into account the dangers associated with fluoride, and its presence in commercial toothpastes, a chocolate-based replacement offers a palatable solution. Fluoride has come under scrutiny over the years - and rightly so. Found in toothpaste, as well as our water supply, this industrial waste has been classified as "the most damaging environmental pollutant of the Cold War" by author Christopher Bryson, who wrote The Fluoride Deception. Linked with decreased thyroid and kidney function, infertility, lowered intelligence, cardiovascular disease, weak bones and increased cancer risk, fluoride is exceptionally harmful. Moreover, the Fluoride Action Network calls attention to the fact that "[j]ust one ... gram of fluoride toothpaste (a full strip of paste on a regular-sized brush) is sufficient to cause acute fluoride toxicity in [a] two-year old child (e.g., nausea, vomiting, headache, diarrhea)." Fortunately, we have an alternative to such toxic madness - in the surprising form of chocolate. Arman Sadeghpour, a doctoral candidate at Tulane University, discovered an unlikely player in the fight against tooth decay - an extract derived from the cacao bean. Using leftover human molars, he applied either fluoride or cocoa extract. Next, the teeth were placed in a specialized machine which pressed an indentation into each tooth. The depth of the depression indicates the hardness of the enamel. Sadeghpour observed that the teeth treated with cocoa extract were more resilient than those where fluoride was used. In a second test, each tooth was left overnight in a solution of either fluoride or cocoa extract. The following day, Sadeghpour subjected the tooth surface to strong acid for 10 minutes. When he measured the amount of calcium that had leached into the acid, he found that the teeth soaked in cocoa extract had lost 8 percent less calcium than their fluoride counterparts. According to a press release by the university, "The extract, a white crystalline powder whose chemical makeup is similar to caffeine, helps harden teeth enamel, making users less susceptible to tooth decay. The cocoa extract could offer the first major innovation to commercial toothpaste since manufacturers began adding fluoride to toothpaste in 1914."